The burst of flavor and the satisfying crunch of granola combine deliciously with the smooth, creaminess of yogurt. While there is no official yogurt and granola diet, using the two together or separately while losing weight is a wise choice. Both provide you with different nutrients, and you can find lower calorie versions of each one. As you diet, foods such as yogurt and granola give you part of your dairy and grain requirement, making them healthy choices. The Choose My Plate site from the U.S. Department of Agriculture includes a place for dairy with meals, and recommends that a grain choice fill up about 25 percent of your plate each meal. If you chose either a 1,200 or 1,600 calorie level while dieting, the USDA recommends having 2 1/2 to 3 cups of low calorie dairy each day and 4 to 5 ounces of grains. Yogurt provides you with calcium and protein. Some fat-free, plain Greek-style yogurt varieties have 13 grams of protein per serving, which is about 28 percent of a woman's needs and 23 percent of a man's. Adequate protein while losing weight can help your muscles stay healthy, even as you lose fat. A cup of plain, fat-free yogurt has 137 calories, a trace of fat and 488 milligrams of calcium. A cross-sectional survey published in the August 2010 issue of the "Journal of the American College of Nutrition" reached a preliminary conclusion that individuals who consume more than 11 servings of dairy a week had "decreased levels of inflammatory markers" which are one of the ways medical professionals evaluate cardiovascular disease. Choose low-fat granola when dieting, as regular granola contains 309 calories and 9.3 grams of fat per 3/4 cup, while low-fat versions contain about 198 calories and 3 grams of fat. Granola can also contain a lot of added sugar, so read your product label before purchasing. Fewer calories in your granola allow you to eat enough foods from the other section of Choose My Plate, including fruits, meats or beans and vegetables. Granola contains about 6 grams of fiber in 3/4 cup, according to the USDA Nutrient Data Laboratory. The September 2006 issue of the "Journal of the American Dietetic Association" published a study which found that the use of a low calorie diet including whole-grain cereals and exercise benefited the quality of the participant's diet, including giving the participants more fiber, less saturated fat and greater amounts of vitamin B-6 and magnesium than the group who did not consume whole-grain cereals while losing weight. Combine 1/2 cup of fat-free yogurt with 1/4 cup of low-fat granola for a 168-calorie breakfast, or add 1/2 cup of berries to the mixture. Use granola as a topping for a green salad, and Greek yogurt combined with onions, herbs and 1 teaspoon of olive oil as a healthy dressing. Coat chicken with crushed granola and bake in the oven, or use yogurt, fat-free mayonnaise and Indian seasonings as a tangy sauce for chicken salad. 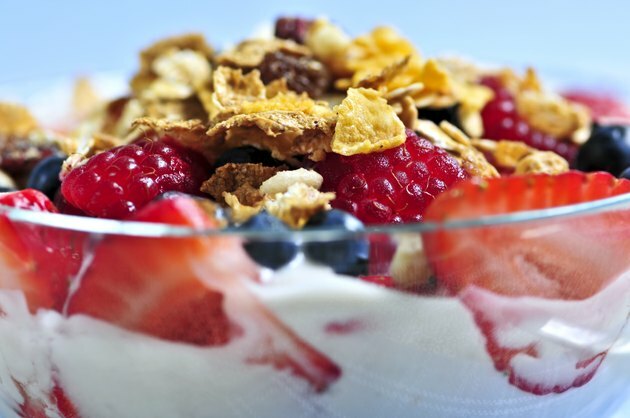 Measure your granola carefully to ensure you do not consume too many calories.